PanARMENIAN.Net - Dubai's flagship airline Emirates is known for going the extra mile. Whether it's an airline safety demonstration in the middle of packed stadiums across the world, or a desi dance to celebrate Diwali, the airline knows how to make heads turn, Khaleej Times reports. And this new photo is doing just that. With sunglasses on. A photo shared by the airline on its social media handle shows the Emirates 'Bling' 777, an aircraft covered with diamonds. The photo is the artwork of Sara Shakeel, formerly a dentist and now a crystal artist. The photo has received over 380,000 likes on the Emirates Instagram handle. 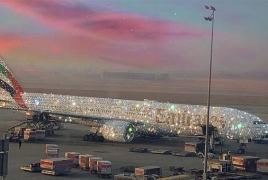 Shakheel had posted her bedazzling creation on Tuesday, December 4 and it turned out that Emirates liked the image so much that the airline asked for permission to repost it and upgraded her flight from Pakistan to Milan. The crystal artist creates her artworks by doctoring pictures, superimposing images of crystals, diamonds and sparkly dust on everything from coffee cups to subway trains and even cats' paws. The image created quite an excitement online with one social media writing: 'Booked an Emirates flight this morning. Full of expectations now', to which Emirates replied with a smiling emoji: 'Hi [passenger], we look forward to welcoming you on board soon'.